Like both legislative statutes and regulations promulgated by government agencies, executive orders are subject to judicial review and may be overturned if the orders lack support by statute or the Constitution. Major policy initiatives require approval by the legislative branch, but executive orders have significant influence over the internal affairs of government, deciding how and to what degree legislation will be enforced, dealing with emergencies, waging wars, and in general fine-tuning policy choices in the implementation of broad statutes. 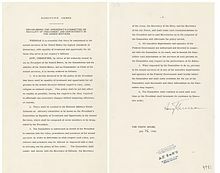 As the head of state and head of government of the United States, as well as Commander-in-Chief of the United States Armed Forces, only the President of the United States can issue an executive order. 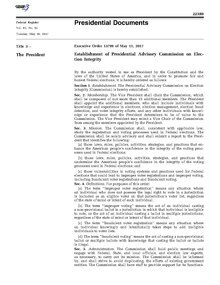 According to political expert Phillip J. Cooper, a presidential proclamation "states a condition, declares a law and requires obedience, recognizes an event or triggers the implementation of a law (by recognizing that the circumstances in law have been realized)." Presidents define situations or conditions on situations that become legal or economic truth. These orders carry the same force of law as executive orders—the difference between the two is that executive orders are aimed at those inside government while proclamations are aimed at those outside government.